Hailed as Europe's most prestigious horse race, the Prix de l'Arc de Triomphe attracts the best thoroughbreds of three year olds and over on the Continent. Over 2,400 metres these amazing examples of speed and courage race against each other, in a bid to win the second highest prize fund in the world. 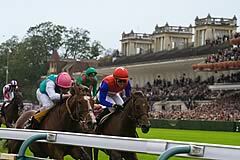 Held at Longchamps near Paris every year in October, it is considered a national institution and one of the highest regarded international competitions in any sport. The now famous race grew out of two former French races. The Societe d'Encouragement, the governing body of French racing in the nineteenth century, originally only approved races for French born and bred horses, but this restriction was removed in 1863 with the inaugural running of the Grand Prix de Paris. This was the first race within the country to be open to the best three year olds from around the globe. It took thirty years for the next international event to be born, the Prix du Conseil Municipal, run over 2,400 metres in October and open to the best horses of different age groups. A handicapping system was in operation based on each individual's previous results. A third race was proposed in 1920 to complement the Grand Prix de Paris, again to be held at Longchamps. It would differ to the Prix du Conseil Municipal in that each horse would compete as equals without any handicapping from previous results. In honour of the victory parade held around the Arc de Triomphe in 1919 following the successful completion of World War I, it was decided to give this new race the name it still holds today, although Prix de la Victoire was also suggested. Prix de l'Arc de Triomphe had been used for a small event held at Longchamps and so the race was born. For the first time it was held on Sunday 3 October 1920 and was won by Comrade. The popularity of the race helped it gain state funding in 1935 and this was used until 1938, when World War II interrupted its running in 1939 and 1940, until it commenced again in 1941 and 1942 in Longchamps. It was then run until 1945 at Le Tremblay before returning home in the last year of the War. More government funding was awarded in 1949, allowing the prize money to be attractive enough to warrant external visitors to enter the race. This funding steadily decreased after the 1970's and 1982 saw the final pot of gold from the government and lottery funding. Since then sponsorship has helped fund this prestigious race, big names drawn in by the high profile and global coverage. Names such as CIGA Hotels, Trusthouse Forte, Groupe Lucien Barriere aits current sponsors, the Qatar Racing and Equestrian Club, secured until 2012. It is this sponsorship that has aided its highly attractive rich purse, the third richest in the entire world. This most popular and wealthy race draws people in their thousands, keen to try out their racing tips and earn themselves a slice of that lucrative pie.